Recipe: Root Veggie Chili | Cook. Vegan. Lover. Heat olive oil in a large saute pan over medium-high heat and add carrots, celery, parsnip and onion to the oil and saute 7-10 minutes until soft. Add in the roasted squash. Add spices and stir to coat the veggies for about a minute. 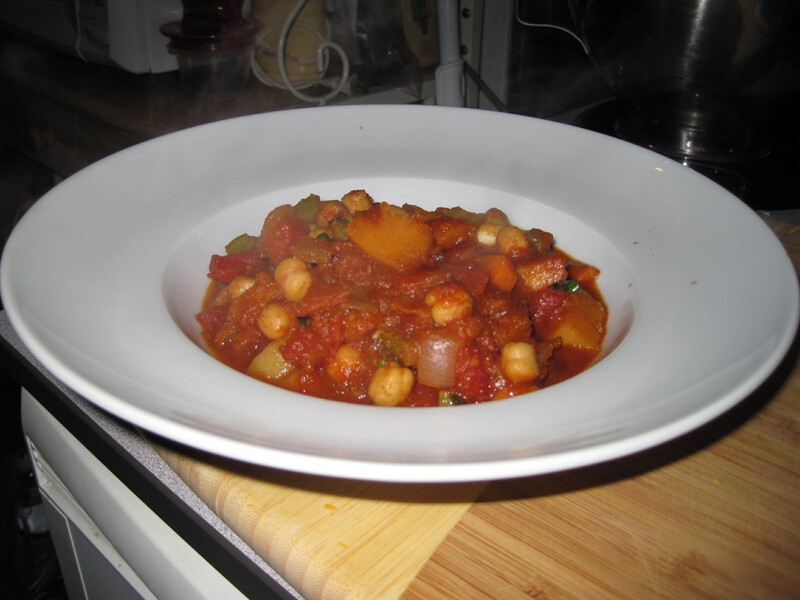 Stir in the vegetable broth, diced tomatoes, chickpeas and tomato paste. Bring to a simmer. Add the green onions and serve! This entry was posted in recipe and tagged butternut squash, chili, recipe. Bookmark the permalink. Pingback: Great Surprises! « Eat. Live. Be Healthy. This sounds great to me. I like the idea of the extra kick from the chipotle powder. The best thing about winter = root veggies! Hi! I made this recipe for girls’ night last night and it was awesome! Just wanted to share. Thanks! !